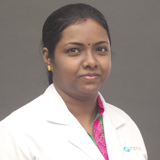 Dr.Suganthi Rajendran completed her MBBS from Thanjavur medical college dr.M.G.R. medical university Tamilnadu, India and postgraduate in otorhinolaryngology, Madras medical college from the same university. She specialises in treating general medical cases, ENT cases and emergency cases. She attended various national seminars and conferences. She has five years experience in India as a GP and ENT surgeon. She is working now in NMC medical Centre in Sharjah. She can speak English, Tamil, Hindi and Malayalam.